FASF President, Ric Lambart, paid a visit to the historic Flabob Airport in Riverside, California, to explore the Tom Wathen Center, set up by and named after the the former owner and Chairman of Pinkerton’s, the oldest Security and Detective firm in the world. Because the FASF also plans to use its future facilites to help inspire and educate local SW New Mexico High School students, it was deemed essential to see how the Wathen Center manages its similar and highly successful vocational educational facilities. Interestingly enough, Flabob is also one of America’s oldest continuously operated airports, one out of which many of our most famous aviators and race pilots flew. Its hangars, tarmacs and runways were graced by such aviation greats as Frank Tallman (famous movie stunt pilot, who called it home base), Aerobatic Great, Art Scholl, and famous aircraft designer, Ray Stits, who organized Chapter number 1 of the Experimental Aircraft Association, or EAA. Chapter #1 is still an active EAA group and helps host some exciting aviation events, such as the Flabob Flying Circus, an impressive gathering and showing of a broad range of vintage airplanes – which take part in both static and flying exhibitions at the field. You might wonder how the renowned airport came to be known as “FLABOB.” The answer is simple: Soon after WWII concluded, it was decided to combine part of the first names of its owners, Flavio Madariaga and Bob Bogen. Shortly after retiring as CEO of Pinkerton in 1999, Tom Wathen bought old FLABOB, barely saving it from the wrecking ball. An aviation enthusiast and even called by some, “savior,” Tom also rescued the hi-tech Glasair Manufacturing Corporation of Washington, after it went bankrupt, in 2001. That company, which he recently sold after turning it around, is now a thriving and highly successful general aviation kit plane maker. The Wathen Center was set up for the purpose of helping young and mostly disadvantaged local teens get motivated towards various productive careers, sometimes even in the aviation industry. Students in the Center are able to take and active part in helping restore vintage museum caliber airplanes and sometimes even help build homebuilt experimental aircraft, as well. The Center also hosts an official Riverside Charter School right on the airport property. Below, several of these student Interns, learning to perform airfield and Center docent roles, walk out to open up their cherished Douglas DC-3 for this FASF visitor’s inspection. The once ubiquitous DC-3 was the backbone of the American Airline industry in the late 1930’s and throughout WWII, as well, during which it was re-named by the Army Air Corps as the “C-47,” or more affectionately, called the “Gooney Bird.” The “Flabob Express” is fully restored and completely operational. This writer had the enjoyable privilege of often flying this veritable twin-engined workhorse, while on active flying duty in the USAF. Without the last-minute intervention of Tom Wathen, Flabob Airport would have been sold for commercial real estate development as has so unfortunately happened to thousands of similar older U.S. General Aviation Airports since WWII. 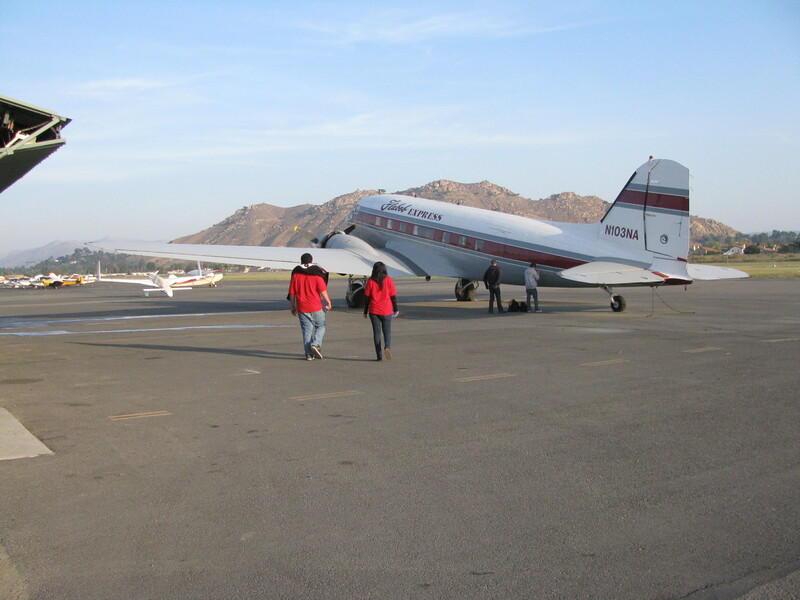 Above are two of the student docents leading our way out to the “Flabob Express” vintage DC-3 Airliner. 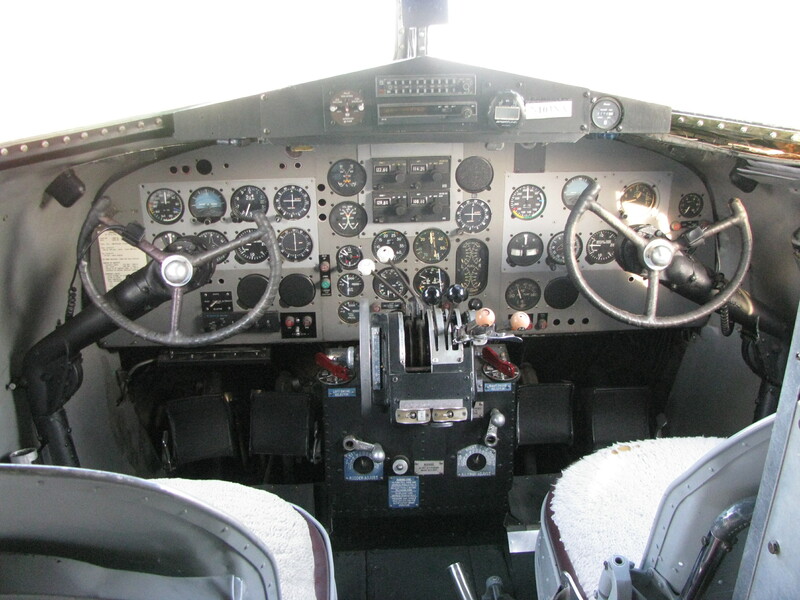 View of the Flabob DC-3’s “Front Office.” Note the WWII styled “steam gauge” type flight instruments. Present day airliners have large rectangular “glass panels,” which are much like flat screen computer monitors or TV screens. Above, L to R, are Veronica Nolasco, Tracy Piscopo, Alan Salgado, Kathy Rohm (Tom Wathen Center Program and Tour Coordinator) and James Jordan. All except Kathy are student Interns at the Wathen Center. The group is standing inside the Flabob Airport’s own fully restored and operational DC-3 vintage airliner cabin. 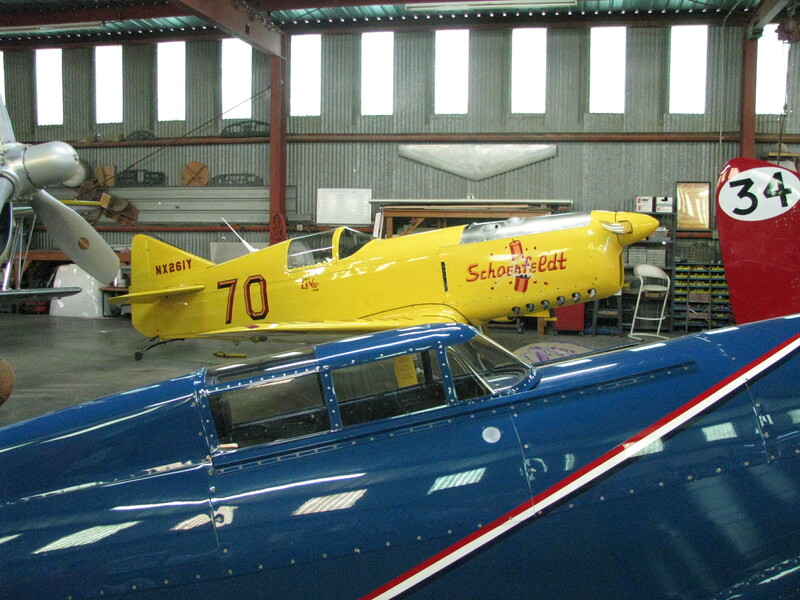 Above, in the Flabob Racing hangar, in its original bright yellow paint, is the famed Schoenfeldt “Firecracker” race plane piloted by renown Lockheed Aircraft Corporation test pilot Tony Levier, back in 1938, when he used it to win the International Air Races at Oakland, CA. Of special note is that the USAF’s one time First Aero Squadron Commander, Major General Patrick Halloran, flew this same replica airship many years later after WWII. Gen. Halloran is also well known for having been one of the few SR-71 Blackbird and early U-2 pilots during his tour as commanding officer of the First Aero Squadron. This entry was posted in HOT NEWS! on March 6, 2015 by FASFRIC.